COURTENAY, B.C- A pipeline presentation to the Comox Valley Regional District drew protesters tonight. The presentation was given by representatives of Steelhead LNG, who are looking to develop a liquefied natural gas project in Sarita Bay on the west coast of Vancouver Island. The facility is being developed by Steelhead LNG through a co-management partnership with the Huu-ay-aht First Nations. It would be built on a 475 hectare area owned by the First Nation, about 70 kilometers south-west of Port Alberni. It includes the construction of a pipeline to deliver natural gas from northern BC to the Huu-ay-aht territory, crossing the ocean at Powell River to the Comox Valley. The rough plan for the ocean crossing would have it run near an existing FortisBC transmission line. 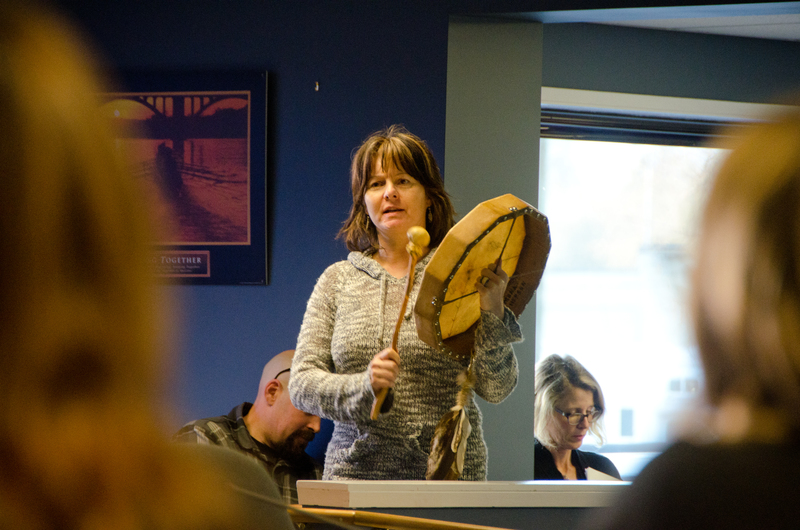 The pipeline was the focus of the presentation given to the CVRD’s board of directors. According to information brought forward during the presentation, the line would be roughly 1,000 kilometres in length, and 48 inches in diameter. The working area for the project would be 50 metres wide along the right of way, and it would have 30 major watercourse crossing, including the Strait of Georgia. A concept map of the route presented tonight also shows a second crossing from the Powell River area to Texada Island, and on to the Parksville area. There would be multiple smaller crossings of other watercourses. After the line was installed and buried, greenery would cover the earth over the pipe along the right of way. The formal project description is expected to be submitted this spring, with an environmental assessment in 2020, and construction in 2021. If it went ahead, the line would likely be in service by 2025. 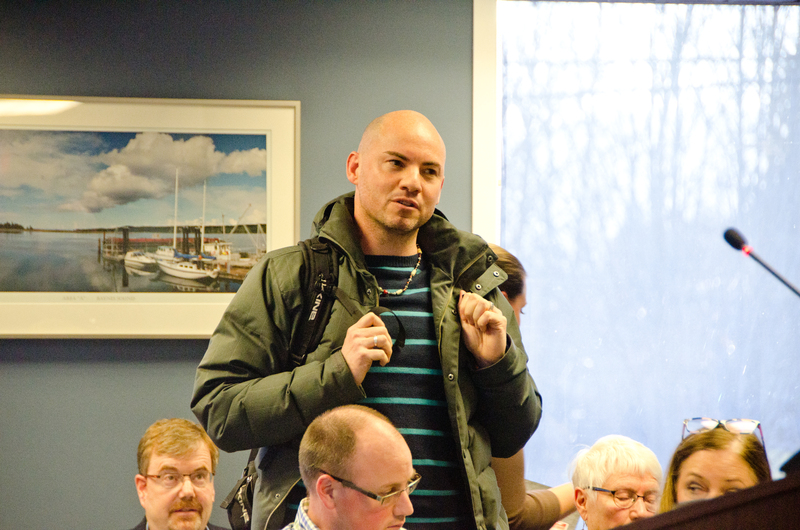 Stewart Dill, Steelhead’s director of Indigenous and Community Relations for the line, handled questions arising from the board of directors. 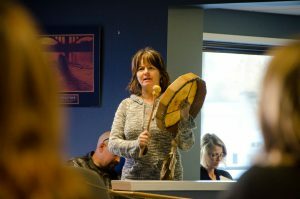 One of those questions came from Area B director Arzeena Hamir, who asked if the company had approached the K’ómoks First Nation (KFN) for their input. Dill indicated that the company has approached KFN, but didn’t want to speak for them at the meeting. He also stated that the company had been approaching the elected and hereditary leadership of First Nations along the projected route. Area A director Daniel Arbour believed the project had economic value, but questioned its long-term viability while expressing doubts about Canada’s overall strategy to export LNG to Asia, citing the region’s investments in renewable energy sources. When the presentation and discussion came to a close, a small group of protestors stood up from the audience. 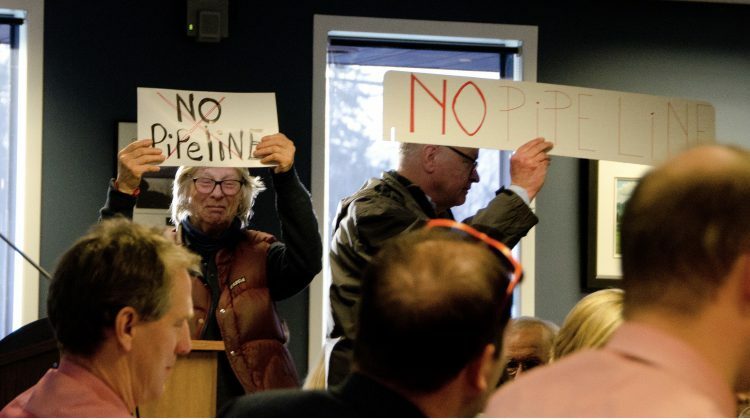 Sally Gellard and Phil Wickhesier held up signs reading “No Pipeline!” while chanting the same slogan. CVRD board chair Bob Wells spoke up during their protest, saying it would be a good time to remind people that they could register to speak as delegations. Valley resident Kiyoshi Kosky, who made an unsuccessful bid for a Courtenay council seat in the recent municipal elections, also spoke during the brief protest. “Climate leaders don’t build pipelines,” said Kosky. Wells thanked Kosky while he was speaking. Gellard said she had been surprised by the pipeline proposal, and didn’t think Vancouver Island needed it. She wanted more people to protest against the line, and believed there would be in future. “People don’t know that this is really happening,” said Gellard. Speaking after the discussion had ended, Wells said that protest had been anticipated, comparing it to the disruption at North Island College in recent days. “It was something we had anticipated to a certain degree, as I mentioned to people, they have an opportunity to do a delegation as well,” said Wells. As for whether or not the pipeline plan would be a fight in the Valley, Wells believed it was “early days”. “Whether or not it passed financial muster from a business case perspective (is a factor), but I certainly would think that if it moves forward, that it’ll be contentious and it’ll definitely be lines drawn in the sand,” said Wells. He didn’t have a personal opinion on the proposal, when asked. “I don’t really have any detailed information,” said Wells.